Hapuna Golf Course Hole 2: The second of two short uphill par fours to start the round, this one doglegs left and has trouble on both sides of the fairway. The green is significantly sloped from back to front and will reject and shots coming up short or left back down the hill. 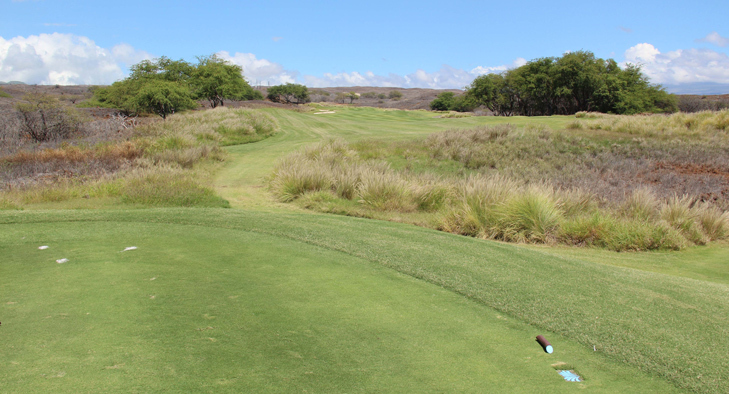 Hapuna Golf Course Hole 3: The 3rd is a par five and features a wide landing area culminating with a hill. From there, the hole winds down around a lake to the left. However, there are bunkers and long grasses to the right to catch the golfer to is too afraid of the water. The green is also flanked by lava long. Hapuna Golf Course Hole 6: The 6th is the toughest hole on the front and features a tight drive that is slightly downhill. From the fairway, the golfer can't get distracted by the ocean views as the green is placed between hillside right and more dangerously, a large bunker, cart path and certain doom, in that order, to the left. Hapuna Golf Course Hole 8: The second par five of the day is reachable in two with a couple of good, straight shots and is fairly tame if played conservatively. However, there are lava fields and long grasses awaiting any wayward shot. 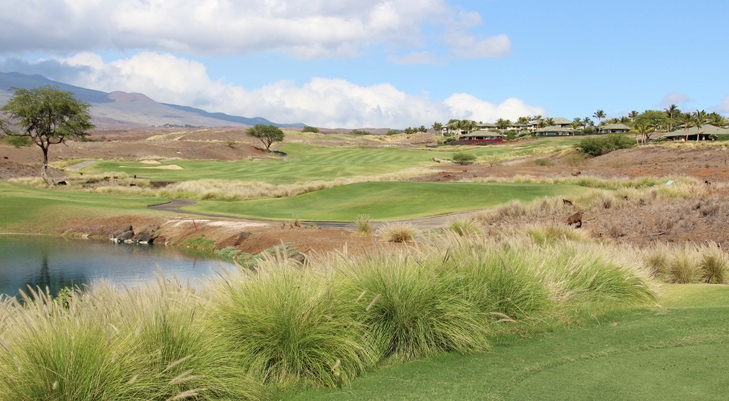 This holes feels very remote as the golfer is surrounded by nothing but the rugged nature of the Big Island and is treated to views of Mauna Kea and the Kohala mountains..
Hapuna Golf Course Hole 10: This great start to the back nine presents the player with a choice. The drive can layup short and/or right of the bunkers to leave a longer approach to the green. 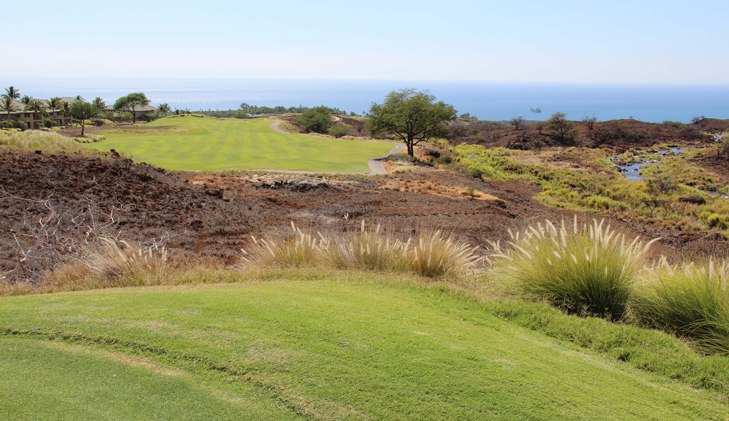 However, a drive can also flirt with the trees and lava left and clear them for a very short approach to the green. 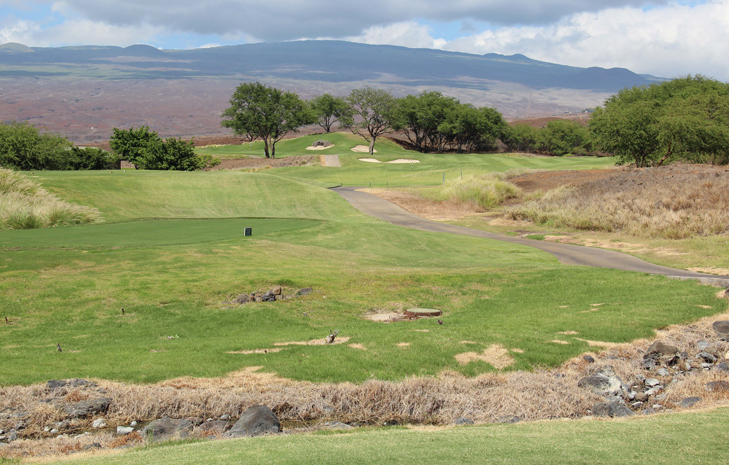 Great views of the Kohala mountain range and ocean are plentiful throughout the hole. 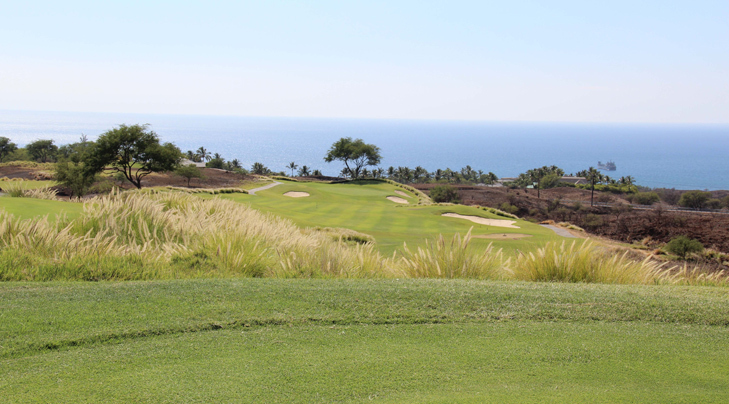 Hapuna Golf Course Hole 11: This downhill par five is one of the most visually enticing in the world. 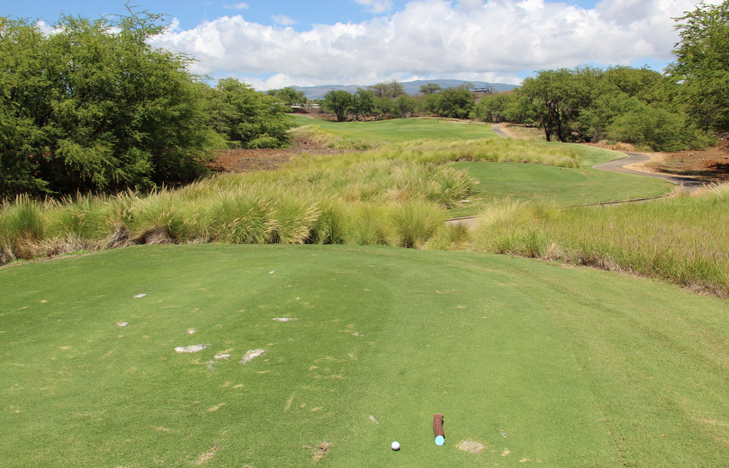 From the tee the golfer can see Maui and has mammoth views of the ocean and surrounding mountains. There is even a stream to the right of the hole where wild goats can be seen catching a drink. The tee shot itself must stay on the fairway or find lava or, worse, expensive houses way left. The second then must cross a depression on the left and avoid more lava to the right. The green is protected by a large bunker to the front. Hapuna Golf Course Hole 12: Another world class downhill par four, this one has bunkers, long grass and lava on either side of the fairway and, when the wind is up, the ball will be in the air a long time and will be subject to a ot of movement. The green has bunkers on either side and is sloped strongly left to right. Hapuna Golf Course Hole 15: The last par five of the day is long from the back tees and uphill to a green that is way right of the fairway. There is also a large family of goats that frequents the area, so be careful not to get scared when one jumps out of the long grass in front of you. The main trouble here is the uphill approach to the green that has to be the right distance or will face an awkward chip. Hapuna Golf Course Hole 17: This par four features a drive that is downhill but partially blind once the ball gets passed the bunkers on the right or the trees on the left. There is OB way left and a laval hill behind the bunkers, so a straight drive is a must. The approach is then downhill to a stunning vista of the coast. Under no circumstance should the golfer go over the green as it is steeply downhill to trouble. 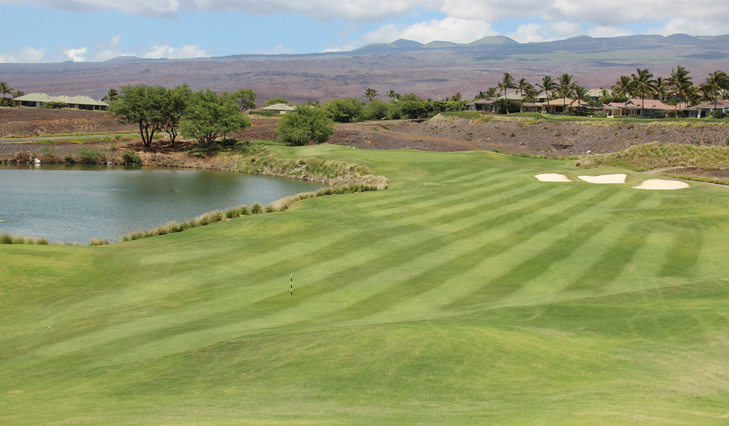 Need more Hapuna Golf Course Reviews?